Hunting for squirrels can seem complicated, but all it takes is some knowledge and getting out into the woods to try. From learning about the most active times of the days of the best ways to hunt them, hunters benefit by learning some squirrel hunting tips. Some people are intimidated to try because they are a smaller target. It is worth your time! Many people forget the lure of learning how to hunt squirrels because they prefer the larger game. However, as you sit and wait for the big buck to arrive, the woods around you are full of life. Squirrels dance and chase around you, and it is easy to remember why so many people love to hunt them. If you have never gone out on a good, old fashion squirrel hunt, you are missing out on a unique and challenging hunt. Squirrels can be found in most areas of the country. 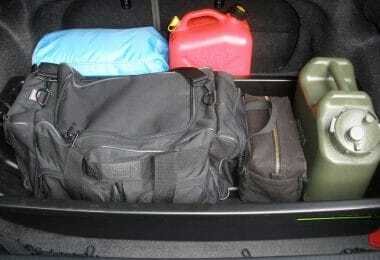 With high daily bag limits, finding some tricks and tips to help get you the best shot is smart. No matter how you opt to hunt for squirrels, the catch is to find the squirrels while they are unaware. Most hunters use one of the two typical ways to hunt squirrels – tracking or waiting. Both ways have their benefits and disadvantages, so let’s take a look at both ways! If you spend time out in the woods, especially during deer season, you are bound to hear squirrel movement. You will hear falling leaves and branches from the jumping and scurrying of the animals high in the trees. You can simply pick a place to sit and wait for the squirrels to arrive. Waiting can take some time, but you are sure to find a few nearby. However, while the leaves are still on the trees, it can make the sight of squirrels difficult. You are looking and stalking a moving animal amongst moving leaves. It can pose troublesome. Try still hunting on a hillside or a ridge with a solid line of food source trees. Nothing will make you feel like a real hunter than stalking a trampling squirrel through trees and bushes for the perfect shot. However, it doesn’t always play out as our imaginations hope. You have to move very quietly throughout the woods to avoid detection. In most states, squirrel season opens a few weeks before deer season, so it gives you some time to get out in the woods and practice before you encounter your big buck. Plus, you can check for some deer signs. One of the benefits of tracking squirrels is you will have the opportunity to shoot more than once at the same target. Typically, when you are sitting, one shot is all you get. If it isn’t accurate, you are out of luck until the next one scampers by. 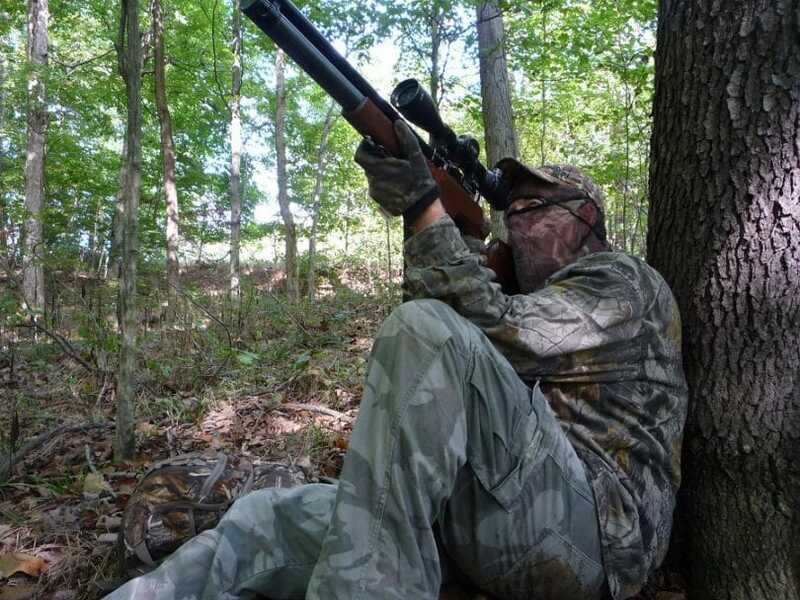 If squirrel season just opened, stalking is one of the best options because they are less wary. All of the younger squirrels are active and unsuspecting. All of the thick leaves and brush limit their vision. You are likely to find them at their sources of food, happily eating. It isn’t a wise idea to track squirrels when the sun is at either of your shoulders. Your shadow will be perpendicular to your movements. Squirrels have a better chance of noticing you. Finding some great locations to hunt squirrels will pay off significantly. 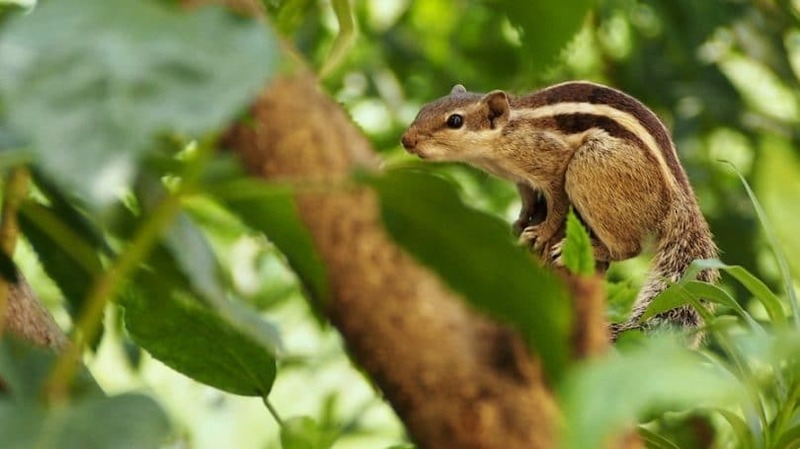 As you can imagine, nearly any place with trees can lead to the discovery of squirrels. In fact, you may find squirrels in your grocery store parking lot if there are some bordering trees. Although that is the wrong place to hunt for squirrels! One of the best places to look for squirrels is along creeks and streams, with borders of hardwoods or dense forests. They love trees, but they particularly enjoy oak, hickory, sycamores and ash trees. However, hunting on a creek or stream means you may have to use a kayak to access the areas. Like hunting any animal, finding a food source increases your chances of stumbling upon a squirrel. Acorns are one of the essential food sources for squirrels and can be found most autumns in sufficient numbers. Oak trees are the sources to discover. However, it is important to remember not every tree is going to produce acorns. Instead, find an abundant area or a particular oak variety to see if an individual species is producing heavily. Squirrels also like other food sources. They love seasonal fruits, like wild cherries, wild grapes, hackberries, mulberries, and persimmons. Finding local sources of fruit can yield significant results, even if for short periods of time. Remember, every area is going to have different food sources your local squirrels will enjoy. Spending some time discovering the sources and favorites will yield more squirrels and will fill your stew pot quicker. You could even look for squirrels amongst some crops. They love corn, so hunting corn fields is an excellent option. You may notice them running along the ground. However, no matter where you find them, you are unlike to find a bunch of squirrels together is the food options are plentiful in your area. They don’t have to congregate together with abundant food. A smart trick is to wait for the scarcity of food. Then, find a remote tree or food source. The squirrels will come. Something that is important to remember is that squirrels are vocal animals! In the presence of a predator, they will bark at predators. Also, they bark and make sounds at one another. A wise hunter learns the sounds of squirrels. When you hear their sounds, stop and see if you can determine their distance from you. Once you have found a few great locations to hunt squirrels, it is time to get out there and hunt. 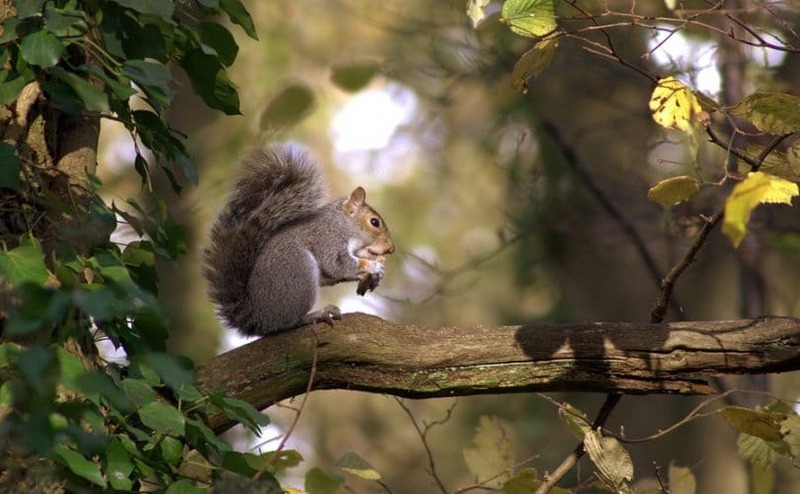 Squirrels, like all animals, have certain times of day when they are more active. You are most likely to encounter squirrels in the daylight hours. Hunters have some of the best luck during the morning and evening hunters, which also is when hunters have the best chance of finding a deer. However, activity periods can also vary based on the species of squirrels you are hunting. For example, gray squirrels are more active at first light; you should be in the woods at dawn and for the first two hours. On the other hand, Fox squirrels are more active after first light, which means more time under the covers in bed for you! For more information on the how to know the best times to hunt for game, see our article on this important topic. When deciding what day to go hunting, it is important to include weather in your consideration. Weather controls squirrel behavior and the best hunting method for that day. Squirrels love beautiful days when the weather is pleasant. If the morning is sunny and enjoyable, you are likely to find more squirrels out eating and filling up on the day’s activities. It is on the pleasant and dry days that hunters have great luck sitting and listening. You will be able to hear the movements before you will visibly see a squirrel. Also, if it is dry, you are likely to make more noise. The breed of squirrel matters when it comes to wet days. Some varieties, such as Bushytail squirrels, don’t mind the wet days. You may find them running across the ground with their tails over their head, acting as a sort of umbrella. Wet doesn’t mean a storm; rather most squirrels don’t mind a mist or drizzling day. On these days, hunters will have excellent luck stalking squirrels. The ground is wet and damp, so you are less likely to make noise. The leaves won’t rustle as quickly, so you can track a squirrel without alerting them to the danger. A heavily storming day with high winds is a different matter for squirrels. There is no better way to stop any squirrel activity than an approaching front or a massive storm. During these times, they prefer to head to their den and wait for the weather to change back, which means your chances of the rate of success drastically decreases. Winter is also a difficult time to hunt squirrels. They don’t hibernate, but they do stay in their den for extended periods of time. Their inactivity means you have a smaller chance of finding active squirrels. You may still have success, but it could be a long and cold day before you bring home enough for dinner. 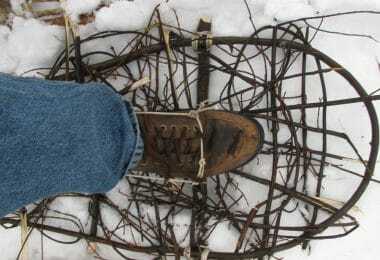 Here are some winter hunting tips. Lower temperatures drive squirrels into a semi-hibernation. They must eat still, so on the first sunny day after days of clouds, you are likely to find active squirrels looking for food. 10 am to 2 pm are some of the best times to hunt; squirrels love to sun on branches during the winter. 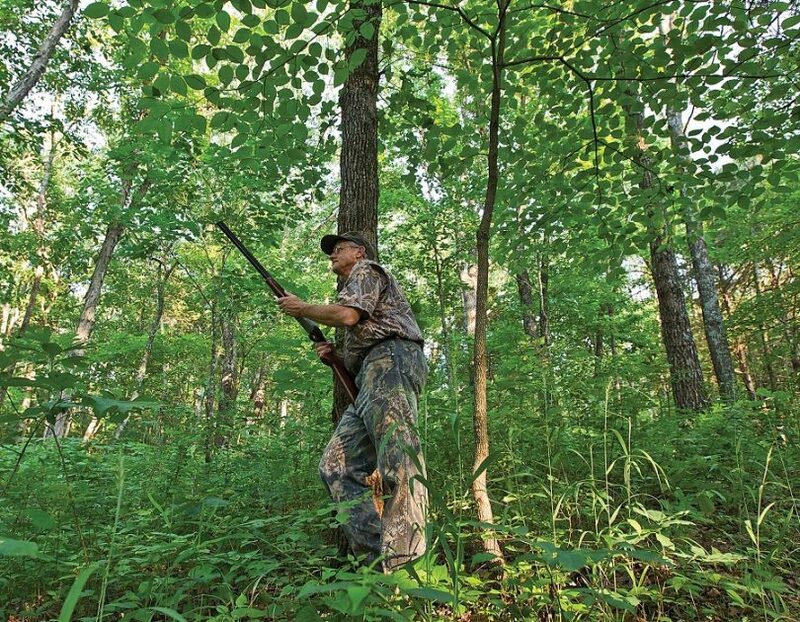 Hunters may have success near black walnut trees. If the squirrels aren’t on the branches, they are likely to be low, looking for nuts. 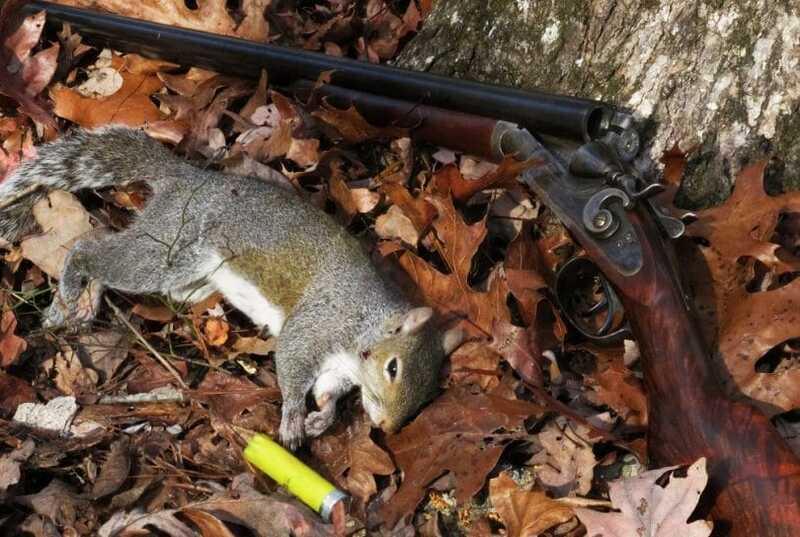 Some hunters swear by using a rifle to hunt squirrels, while others prefer to use a shotgun. There are reasons to use both; neither option is wrong. Rather, it just depends on the hunter and what you are most comfortable using. 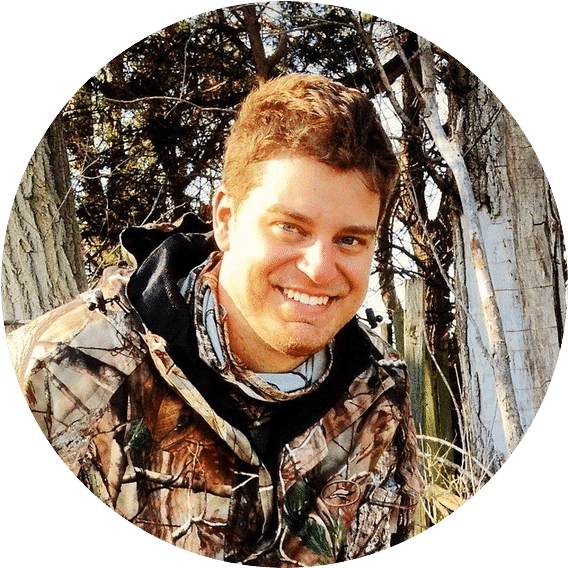 You don’t need massive firepower to hunt small game. Shotguns are better when tracking and stalking squirrels. 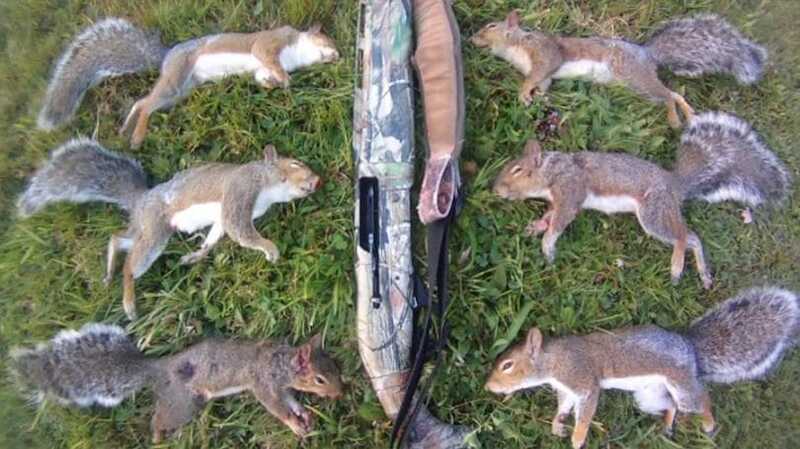 For running squirrels, a shotgun is the best option. 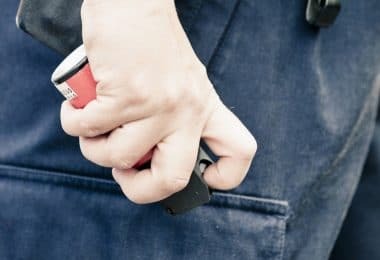 While most shotguns are far from quiet, you may want to use a .410 because they are the closest to quiet a shotgun can get. 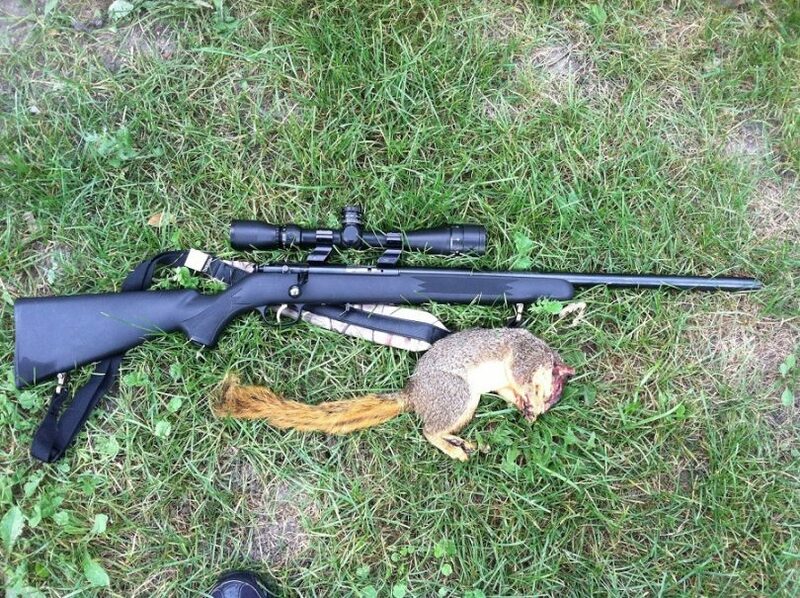 It is an ideal firearm for hunting squirrels. Also, even though they are small, using a No. 5 shot is the best option. They have thick skin and can be harder to kill. That is the smallest size shot you should use. Some hunters prefer a No. 6 or No. 7 shot size. One of the disadvantages of shotguns is they will leave buck shots in the meat. If you are opting to sit and wait, a rifle gives you the option for extended range shots. The squirrel won’t even suspect you are nearby. When considering rifles, you may want to select a .17 or .22 caliber rimfire rifle; they aren’t loud enough to scare all the other squirrels away for hours. Rifles aren’t as beneficial when the squirrels are on the move and jumping. If you are looking at a particular model, consider the Ruger 10/22 rifle. It needs .22LR ammunition. For an informative review of the top hunting rifle, check out our article to find out more. When predators approach, squirrels stay completely still to hope to stay out of their line of sight. If you are sitting still and see a squirrel at the perfect location, stir the leaves around you in an odd pattern. Doing so encourages the squirrels to start to move because they believe all of the other squirrels are feeding. Some prefer to hunt with a distress call that helps to mimic the sound of a young squirrel in trouble. The sound urges other squirrels to leave their food source and dens to help, providing you with an excellent opportunity to take many shots. If your state allows it, squirrel hunting with dogs is a great way to increase your success level. A well-trained dog can trail a squirrel and discover its hiding location. Then, the dog will alert their owner. Check out our article on how to select the right hunting dog breeds for your hunting companion. Humans don’t have noses anywhere near as strong as canines. Using a dog gives a substantial advantage to the hunter. However, the success requires first finding the best hunting dog possible. There are plenty of breeds that have natural instincts for hunting. 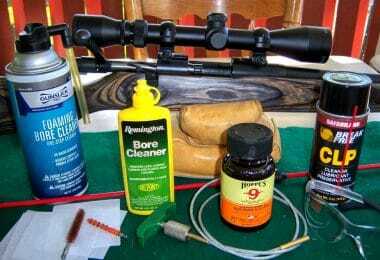 These are just some great tips for squirrel hunting. The first step to a success squirrel season starts in the weeks beforehand. It is crucial for hunters to scout the local area. Once you find a stable food source in the area, you can decide where to sit and wait for squirrels. Picking the right time of day and weather to go out, and the weather is knowledge every hunter needs to understand. All of the skills and tips culminate together to increase the success of your hunt for squirrels. Before you leave for your next hunting trip, take a look at our reviews of the top hunting gear to help you.